Our title this week involves the impending candy-filled holiday for children rather than a review of the latest iteration of the Halloween franchise, sill starring Jamie Lee Curtis, unseen by me. But I did manage to have another week where I was able to see an “oldie”, a “goodie” and something interesting. First of all, I would be remiss if I didn’t acknowledge the World Series win by the Boston Red Sox last night in LA against the Dodgers. This team lost only one road game during the playoffs (and it was 18 innings long!). They showed resilience and fight and defeated the three best teams in all of baseball (Yankees, Astros and Dodgers). 2018 World Series Champions sounds good! 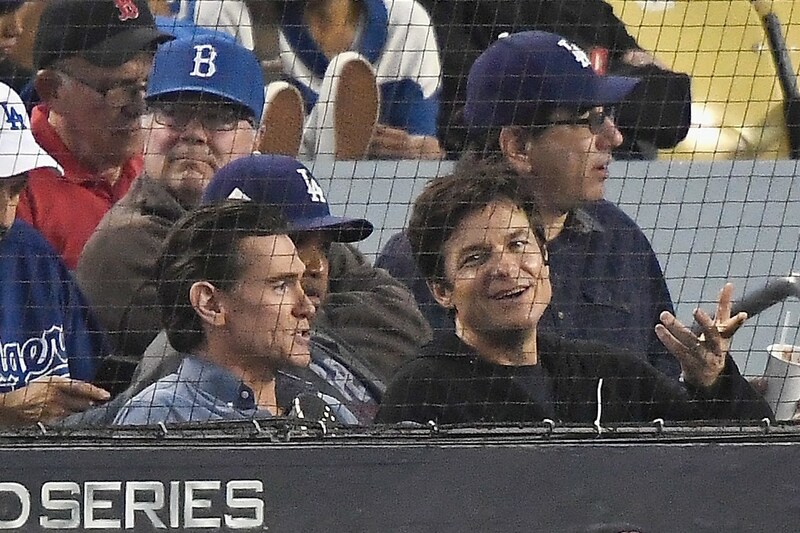 Oh and there was a movie presence at the game last night as Matt Damon was there in full Red Sox hat and “I Am With Stupid” shirt with Jimmy Kimmel and Ben Affleck, Jason Bateman sitting next to Billy Crudup, and of course Mary Hart. The “oldie” was a DVD rental for the 1987 Kevin Costner film No Way Out, with Gene Hackman and Sean Young. Sean Young was at the peak of her fame, having been in Stripes, Blade Runner and Dune. The story was a political thriller with some espionage thrown in for good measure. Costner plays a Navy man, who is hanging around Washington DC and meets a buddy who works for a powerful politician (Hackman) hile impressing Young at a party. They hook up. He then heads off to sea where he can be heroic on the bow of a ship in a storm (which interestingly makes the newspaper). Powerful politician decides to bring him in to assist with some work based on that story in the newspaper, and things move along from there. The buddy begins to spin a new perspective on a turning point event and the title begins to take on more meaning. I enjoyed this film when I first saw it in the theatres as a young 20-something, but that may have been just Sean Young. There is some intrigue here, but generally it wasn’t as good as I remembered it. The ultimate resolution is a little less satisfying than I had remembered. If you can rent from a library, as I did, for nothing this can fill some time and you can see some stars from 30 years ago. The “goodie” is a modest thumbs up for the TIFF release Beautiful Boy starring Steve Carrell and Timothee Chalamet in the leads. This is an addiction story, tracing the real life events surrounding Nic and father David Sheff. In this film, I found that the director’s choice to bounce around haphazardly with the timeline was more than a little distracting and took away from the ultimate story. Had he chosen to be more linear it might have helped some. The starting point is Carrell seeking information about crystal meth from a doctor (Timothy Hutton). But before answers are given, we are whisked away to an earlier time. Much is made of the pictures of the young boy Timothee is playing and later the young man who he becomes. Father and son seem to be close, with a broken family early on which may or may not impact the choices the young boy makes. Parents bicker and are snippy with one another (Dad having moved on, remarried and had a couple more kids with new wife, played by Maura Tierney). This is not for the feint of heart, as we see the slippery slope of looking for the greater high. It is depressing seeing the adults swirl around the young man who demands more and more of their attention which takes away from others in their lives. He is a walking time bomb, and you never know just what Nic you’re going to get. I would have liked to see more of the Nic perspective on what happened to him; how was rehab? How did he perceive it? What happened there? What was the thought on relapse, and when did temptation overcome the teachings you gained in self control? I further wonder where did all the money come from for the young Sheff to maintain his habits? Dad seems pretty comfortable, yet it’s hard to see where and how all this could be paid for; he disappears for seemingly long periods of time. There is a good scene (in the trailer as well so I give nothing away) at a restaurant between father and son. You can see Timothee heading in a downward direction unable to maintain control over this addiction. Likely there are award nominations to come from these performances (Carrell and Chalamet). In the end, the film felt more like an infomercial for the rehab business and the lack of funding for these valuable support services. In a society that is fundamentally built on the idea of personal freedom and liberties, there are those who will choose to destroy their bodies and their souls for moments of fleeting and ultimately unattainable artificial joy. It’s just hard to watch it, and see the impact that it has on those innocents around that person. Finally, I watched Victoria and Abdul which is the new Stephen Frears film about Queen Victoria (played by Dame Judi Dench) and her Indian consort and assistant (Ali Fazel) who her son, and later monarchies tried so very hard to wipe from history. Frears has done High Fidelity, The Grifters and The Queen and more recently has poked at British society with Dame Judi in Philomena (and the Catholic church) and this with Queen Victoria. Interesting here is what is not filmed really and left until the end (the cover up and attempted erasing from history). But back to the film. The story is about the relationship of Victoria in her final decade or so of her longest reign with this Indian gentleman who she happened upon at a dinner in which she was given an Indian coin. All this takes place in the 1890s with Britain still ruling over India. The Queen had never visited (it was deemed too dangerous for her) and she seemed tired of those buzzing around her looking to stake their claim in the next monarchy. She was tired and listless and going through the motions of her everyday life. The entrance of Abdul heightens her interests and brings her back to life. It is hinted that she found him attractive and felt betrayed when he discloses his marital situation. Because of him, she takes interest in learning about the culture and language of her realm (imagine that). I wondered as I watched how a King like Henry VIII would have handled the situation; with squabbling and activities taking lace against the King’s wishes. I suspect that it would have been met more harshly. You can also see some of the same activities that occurred around Diana’s time and those who provide guidance and advice to the monarchy from the movie The Queen. In the end, this was a satisfying story and I am glad that the evidence was uncovered that could bring this back into the spotlight. I further wonder how a future King, like William, might view this as a reflection on his ancestors, and those around him who provide that guidance and advice all in the name of “protecting the Crown”.